The invention relates to a method for the purification of a composition comprising (meth)acrylic acid, at least one impurity and water, wherein the composition has a water content ranging from 0.55 90, in relation to said composition, in a purified phase, containing (meth)acrylic acid and at least one impurity, whereby in the purified phase the amount of the at least one impurity is less than 7 wt. 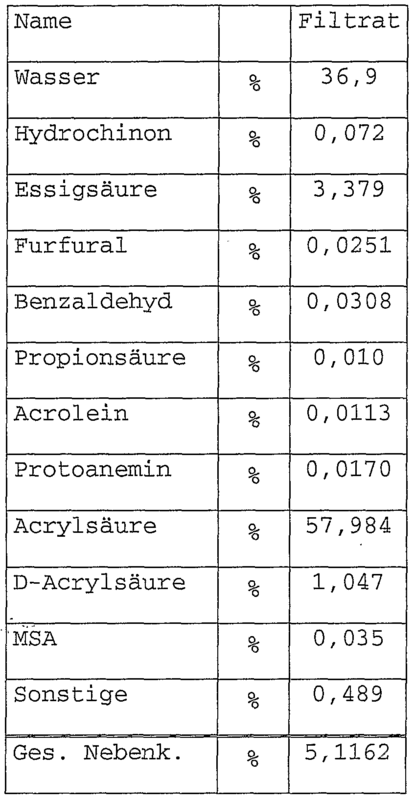 % in relation to the methacrylic acid in the purified phase, consisting of one stage. The inventive method comprises the following steps: a) (meth)acrylic acid is crystallized out of the composition, forming a solution containing a mother liquor and (meth)acrylic crystals; b) (meth)acrylic acid crystals are separated from the mother liquor; c) at least one part of the separated (meth) acrylic acid crystals is melted to form a melt; and d) one part of the melt is returned to step a) or b). The non-returned part of the melt is provided in the form of a separated (meth)acrylic acid. The invention also relates to a device for the production of pure (meth)acrylic acid, a device for the polymerization of (meth)acrylic acid, (meth)acrylic acid or polymers which can be obtained from said methods, the use thereof and substances containing said (meth)acrylic acid or polymers. The present invention is-containing to a method for purifying a (meth) acrylic acid composition, to an apparatus for preparing pure (meth) crylsaure, an apparatus for the polymerization of (meth) acrylic acid), (meth) acrylic acid or polymers, available- from these methods, fertil their Verwen- and directed this-containing substances. "(Meth) acrylic acid" is used in this text for the compounds with the nomenclature name "methacrylic" and "acrylic acid". Of the two compounds of acrylic acid is preferable in the invention. The work-up of (meth) acrylic acid to high purities of up to> 99.9 wt .-% is often desirable for their use in polymers. Thus, in the case of superabsorbents called polyacrylate-based example in the hygiene sector that certain by-products may only be present below the detection limit. As an alternative to producing high-purity or- ganic substances crystallization is mentioned. Layer crystallization (Wintermantel et al., Chem. Eng. Tech. 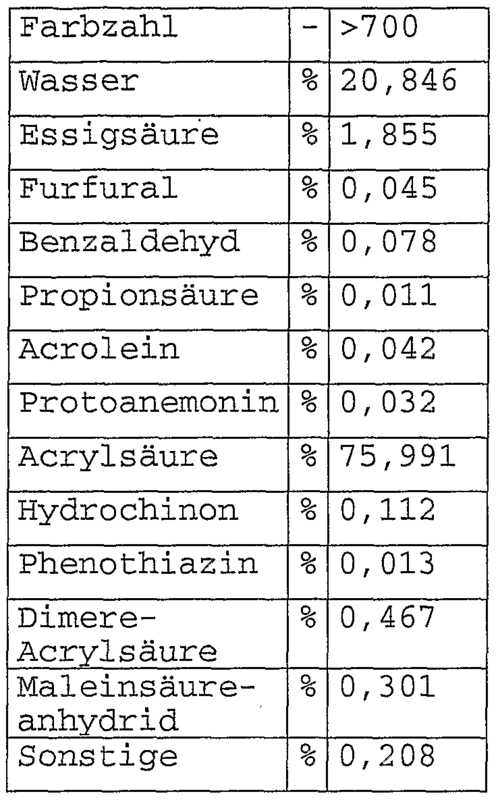 1991, from 63.881 to 891; Steiner et al, Chem. Ing. Tech. , 1985, 57, 91-102). Often, however, a crystallization step is not sufficient by itself to byproducts sufficiently well or remove from the crystals, as Mikroein- conclusions from mother liquors or incorporation of impurities at crystal defects, etc. can not be excluded under finite crystal growth conditions. Also, the adhesion of the mother liquor on the crystal can degrade the purity of the products. For this reason, the crystals formed are common, particularly in the case of a crystal suspension, washed after separation from the mother liquor with wash liquids and / or the crystals are subjected to layer or suspension crystallization a sweating process, can optionally be depleted in which impurities of any kind , Continuously such a process can be carried out in so-called wash columns. An overview provides here the disser- tion of Poschmann (To the suspension crystallization of organic melts and after-treatment of the crystals by sweating and washing, Diss. Uni. Bremen, Shaker Verlag, Aachen 1996). The EP0616998 discloses a process for the preparation of> 99.9 wt .-% sodium acrylic acid starting from vorgerei- nigtem product having an acrylic acid content of 97.771 wt .-%. The cleaning effect is achieved by interaction of dynamic and static crystallization process layer. As the final crystallization organ is a so-called falling film crystallization application here. The operation of such a system is only intermittently available and due to the many process cycles that are necessary to obtain the corresponding purities, high apparatus as logistical effort and a relatively high expenditure of energy. From W099 / 14181 is known, crude (meth) acrylic acid to crystallize for cleaning in a first step and, if necessary, to work up in a second step by wash columns. The disclosed process goes di- rectly from the condensation products of the catalytic gas phase oxidation to produce (meth) acrylic acid from. In this method, that the resulting after washing and separation of the crystals mother liquor is recycled to the condensation step is described. By this method was obtained from 90.972 wt .-% sodium acrylic acid, a product with a purity of 98.8816 wt .-%. However, this is not sufficient for some technical applications. So just the content of inhibitors and aldehydes in the pure (meth) acrylic acid forms a critical size, which provides for longer, for example, in the downstream polymerization of disadvantages. From Nienrood et al. has been described that acrylic acid can be easily purified by Suspensionskristallisätion and subsequent treatment in a hydraulic wash column (so-called TNO method; Proc Bremer International Workshop on Industrial Crystalli- zation, Bremen, 1994, eds . : J. Ulrich, S.4-. 11; Purifi- cation potential of suspension Growth Melt Crystalliza- tion, Proc 4 uh International workshop on Crystal Growth of Organic Materials, Bremen, 1997, ed . : J. Ulrich, Aachen Shaker Verlag, S.139-145).. 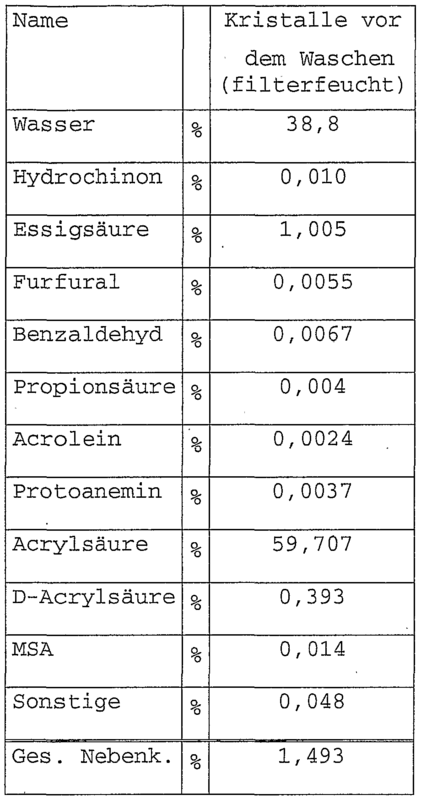 The acrylic acid used in these studies was purchased from Aldrich and had a purity of 99.75% by weight. They could be purified by this process to a purity of 99.97 wt .-%. However, the use of acrylic acid with lower purity was not disclosed. (Meth) acrylic acid is usually a complicated distillation process in which toluene is necessary in part to the use of entraining agents such as, subjecting the obtained in a (meth) acrylic acid reactor and subsequently in a quench dissolved in water (meth) acrylic acid to pass through a subsequent crystallization process len to erzie- high levels of purity. A disadvantage of distillation processes for (meth) acrylic acid, the (meth) Acrylssäure- is subjected to thermal stress during the distillation process, whereby, for example by a partial (pre) polymerization, change their properties. In general, the present invention is based on the object to overcome from the prior art resulting disadvantages by providing appropriate technical teachings. According to a further object, a method according to the invention is to be provided for producing high purity (meth) acrylic acid from an impure crude (meth) acrylic acid stream from a process for producing (meth) acrylic acid. It should the process in terms of the (meth) acrylic acid gentle, readily usable on an industrial scale and therefore superior from the economic and ecological point of view the process of the prior art. Specifically, in this context, an excellent purification ability to call entertainment high ecological and economic requirements for entry. In addition, another object of the present invention was to provide an apparatus for producing high purity (meth) acrylic acid are available which makes purification of contaminated (meth) acrylic acid to high purity at a low energy cost and trouble-free and environmentally friendly operation. In addition, an object of the invention was to reduce the stabilization of (meth) acrylic acid between production and further processing of (meth) acrylic acid necessary amount of stabilizers. It is an object also to provide a further use of the device for producing the (meth) acrylic acid or one of its components, in which the risk of the undesired and uncontrolled polymerization of the (meth) acrylic acid is low. Further, an object was to provide a method and an apparatus, with the aqueous solutions of very pure (meth) acrylic acid can be manufactured provides. This object, in particular against the background that, in the preparation of (meth) acrylic acid-containing polymers "often aqueous (meth) acrylic acids in solution, suspension of the emulsion polymerizations o- be used. Here- in, it is of interest that the energy expenditure which is kept as low as possible is connected to solvent changes in the individual steps of the synthesis of the monomer synthesis up to the polymerization. In addition, an object of the invention was to provide an aqueous (meth) acrylic acid phase are available which has a comparatively high concentration of water at the highest possible (meth) acrylic acid purity. Such acrylic acid aqueous phases are advantageous because these without a further dilution step directly in the aqueous polymerization of absorbent polymers can be used. In this manner, the previously customary distillative removal of water, followed by purification of acrylic acid, and a renewed addition of water to the polyvinyl lymerisation of the water-absorbent polymer is reduced by one step. d) a portion of the melt is the step a) or step b), preferably step b) is recycled, and the unrecycled portion of the melt as a separated (meth) acrylic acid is present. The separated (meth) acrylic acid forms, unless additional process steps or increments followed d), a part of the purified phase. According to one embodiment of the method according to the invention, the composition as a water-rich composition having a concentration of (meth) acrylic acid with up to 10 wt .-% of impurities in the range of 45 to 80 wt .-%, and water in the range of 20 to 55 parts by weight %, each based on the composition. The aqueous compositions may be derived from a Quenchab- sorber. Furthermore, it may act to neutralization abgerei--assured in the aqueous compositions to a (meth) acrylic acid mother liquor or filtrate from a crystallization, the (meth) acrylic acid continues to be cleaned up. In the case of water-rich composition comprises the forming in step a) the suspension is preferably ferrous ben (meth) acrylic acid crystals or water crystals. It is further preferred that in the case of water-serreichen composition, the melt adjacent to the separated (meth) acrylic acid in the range of 10 to 90 wt .-%, preferably from 15 to 70 wt .-%, and particularly preferably from 25 to 55 weight having .-%, based on the-melting, ze, water. According to another embodiment of the method according to the invention, the composition as a low-water composition ~ ^ a concentration of (meth) acrylic acid with up to 10 wt .-% of impurities in the range of more than 80 wt .-%, and water in the range from below 20 to 0.55 wt .-%, each based on the composition. Preferably, this low-water compositions are from thermal depletion, preferably, the distillation of (meth) acrylic acid or from an upstream crystallization step, which preferably corresponds to the method according to the invention. In a further embodiment of the method according to the invention, it is preferred that the purified phase as a water-poor phase is at least 30 wt .-%, preferably at least 55 wt .-% and more preferably at least 75 wt .-% of (meth) acrylic acid, as well as less 5 wt .-%, preferably less than 2 wt .-%, more preferably less than 1 wt .-% and more preferably less than 0.5 wt .-% water, based on the purified phase, comprising. In another embodiment of the method according to the invention, it is preferred that the purified phase as a water-rich phase at least 20 wt .-%, preferably at least 30 wt .-% and particularly preferably at least 70 wt .-% of (meth) acrylic acid, as well as in the range of 5 to 80 wt .-%, preferably in the range of 10 to 70 wt .-%, particularly preferably in the range of 15 to 30 wt .-% of water, each based on the refined phase has. The water-poor phase can be supplied, for example, a solvent-free polymerization or a polymerization in which the solvent is added only prior to or during the polymerization. On the other hand, the water-rich phase of a solution, Suspensi- ONS or is used in the water as a solvent emulsion polymerization, may be added immediately. By suitable combination of the method according to the invention, if necessary, in several steps, can be obtained in the desired purity (meth) acrylic acid. So can be further purifying as low-water (meth) acrylic acid which is obtained from the crystallization of an aqueous composition (meth) acrylic acid. The thereby obtained as an aqueous composition mother liquor can be further processed by the inventive method to a water-poor or aqueous phase. In the inventive method, it is preferable in step a) (meth) acrylic acid at least partially, preferably at least 5 wt .-%, particularly preferably at least 40 wt .-% and more preferably at least 70 wt .-% of the crystals to crystallize to a crystal having a crystal structure with a surface-before with at least one located at the surface recess, wherein the crystal structure of an orthorhombic Bravais crystal lattice of space group Ibam, crystallographic data a = 9.952 a, b = ll, 767 a and c = 6,206 A has (see FIG. R Boese, D. Blaser, I. Steller, R. Latz, A. trees Acta Crystal logr., Sect (Cr. Str. Comm. ), 55, 9900006, 1999). It is further preferred in the inventive process that in the step a) the mother liquor zumin- least 95 wt .-% (including meth) acrylic acid and water, wherein the water concentration of the mother liquor in the loading range from 10 to 90 wt .-% , in particular from 15 to 70 wt .-%, preferably from 20 and 40 wt .-%. It is particularly preferred that the crystals have a tubular recess in the longitudinal direction thereof, which is preferably dumbbell-shaped, wherein the end faces of the nearly cuboid-shaped crystals, the apertures of the tubular recess are larger than in the plane parallel to the end faces sectional area of ​​the crystal is. Further, it is preferred in the present process that the crystallization in a suspension and not by the formation of layers is carried out, are sev- eral single crystals with each other to im.Vergleich connected to a crystal suspension rigid, compact layer. This is preferably achieved in that the crystallization is not at an appropriate temperature area - is carried out to form a crystal layer - for example the wall of a layer crystallizer. Rather, the forming in the suspension crystals are freely movable in the this-containing liquid phase such as the mother liquor. The recess described above more difficult in an advantageous manner that, impurities such as mother liquor, may be included in the interior of the crystal. Through the open recesses, the contaminants can drain or be washed out. Even a high water content of the (meth) acrylic acid does not lead to the usual increased number of inclusions, but open on both sides of cavities. Is a water-containing suspension to solid-liquid separated with such crystals, the mother liquor can flow tends anhaf- advantageous. This cleaning effect can be used in particular to facilitate the preparation of (meth) acrylic acid significantly and improve the quality of the thus prepared (meth) acrylic acid and pure in this way ne possibly aqueous (meth) acrylic acid to obtain. By quenching the obtained by catalytic gas phase reaction of (meth) acrylic acid with water in a quench fall aqueous (meth) acrylic acids, whose water content particularly preferably in -the usually in the range of 10 to 90, preferably from 11 to 50 from 12 to 40 .-% and more preferably from 25 to 35 wt .-%, based on the total amount of water and (meth) acrylic acid, is located. Such Wasserkonzentra- functions previously had to be almost completely reduced in order to obtain a sufficient purity of the (meth) acrylic acid by crystallization.■ For this purpose, in particular at least one distillation step was necessary ,, the affected by the thermal load on the quality of the (meth) acrylic acid due to the onset of polymerization. In one embodiment, the volume of the recess is at least 5 vol .-%, in particular at least 10 vol .-%, preferably 20 vol .-%, particularly preferably 50 vol .-% of the volume of the crystal. Due to such large volumes of the recesses ensures that can only comparatively little contamination occurs inside the crystal. In a further embodiment of the invention, at least the crystal has an inclusion, wherein the sum of the volumes of the inclusions is less than 30 vol. -%, preferably less than 15 vol .-% and particularly preferably less than 5 vol .-% and yet more preferably less than 1 vol .-% of the volume of the crystal. Due to the small volume of the inclusions of contaminated mother liquor impurities which do not flow out or may be removed by a washing process, the (meth) acrylic acid based on the crystal volume limited. In another embodiment, the crystal has a length, which is on average between 0.001 and 5 mm, in particular between 0.05 and 0.5 mm, preferably be- see 0.1 and 0.2 mm. The length is obtained from 500 randomly selected crystals from -about a light microscope determined photographic images via image analysis system. For this purpose, an image analysis system, consisting sets imported from an optical microscope of connected with a CCD camera and a PC • evaluating unit, wherein a PC program of the company. Soft Imaging System (SIS, V3.1) is used. The feed used in the process of the invention composition, in particular for crystallizing a crystal according to the invention consists at least to 60 wt .-%, preferably 80 wt .-% and more preferably 95 wt .-% of (meth) acrylic acid and water, the rest are other substances, for example, in the synthesis of (meth) acrylic acid obtained by-products, wherein the water concentration between 0.5 and 60 wt .-%, in particular between 5 and 40 wt .-%, preferably between 15 and 35 wt .-% is. With this method leads, surprisingly, but no less advantageous to high purity products, which are also suitable for use in polymers, eg for hygienic areas, are suitable. The method preferably operates continuously. For the separation of the (meth) acrylic acid crystals from the mother liquor, a wash column is advantageously used. For this purpose, the wash column to a separation area, in which the (meth) acrylic acid crystals are washed. For the successful operation of a washing column, it is advantageous that the crystals to be washed are hard enough, and have a certain narrow size distribution to ensure an appropriate porosity and stability of the resulting packed or unpacked filter bed. Furthermore, it is preferred that the inventive method (hoff Welling-, winter coat, CIT 63 (1991) 9, p 805 chap. 3.2.1) by a crystallization effort from 1 to 4.5, preferably less than 1 to 3.5 and is particularly preferably from 1 to 2.5 and, preferably, in addition, from 1 to 1.5. The inventive method can with contaminated crude (meth) acrylic acid to be operated having <99.5 wt .-% (meth) acrylic acid. Preferably, the raw materials used has (meth) acrylic acid has a purity of 50 wt .-% to 95 wt .-%, preferably 75 wt .-% to 90 wt .-% of (meth) acrylic acid. In addition, preferably, can be in the step a), use the condensed mixture to a catalytic gas phase oxidation to the manufacturing position of (meth) acrylic acid directly as a composition in the present process, preferably in. For this purpose, (meth) acrylic acid, usually starting from a corresponding olefin, generated in a reactor, 'then it is brought into a quench in aqueous composition, then, the (meth) acrylic acid are distilled in a distillation apparatus to a low-water composition. The crude (meth) acrylic acid stream thus produced is supplied to the purification device. The method allows the production of very pure (meth) acrylic acid from relatively impure crude (meth) acrylic acid. In the crystallization must be used such as crystallization means which allow it to make the purification process of invention contemporary continuously. Preferably, the suspension crystallization is used. This can vorteilhaf be in a stirred tank, scratch crystallizer cooling disk crystallizer, crystallizing screw, drum crystallizer tube bundle crystallizer o. The like. be performed. In particular, the crystallization variants mentioned in W099 / 14181 can be used for the stated purpose. Of particular advantage are again such crystallizers which can be operated continuously. These are preferably the cooling disc crystallizers or scraper cooler (Diss. Poschmann, p 14). a scratch cooler is very particularly preferably used for crystallization. In principle, any wash column can be used for the inventive method that allows the continuous operation of the purification according to the invention. In a typical embodiment, the suspension is applied in a hydraulic wash column in the upper part of the column; the mother liquor is withdrawn through a filter out of the column, thereby forming a densely packed crystal bed. The crystal bed is flowed through from the mother liquor toward the bottom of the column and forced through the flow resistance downward. At the bottom of the column there is a moving, preferably rotating scraping device or scraper, which again generated from the densely packed crystal bed and introduced to the lower part of the washing column wash melt a suspension. This suspension is preferably carried out by a melter, preferably a heat exchanger, pumped and melted. A portion of the melt can, for example, serve as wash melt; this is then pumped back into the column and preferably washed from the traveling in the opposite direction the crystal bed, ie the crystallized (meth) acrylic acid is acrylic acid washed in countercurrent by the recycled (meth). The wash melt causes the one hand, a washing of the crys- metals, on the other hand the melt crystallizes on the crystals, at least in part of. The released enthalpy of crystallization warms the crystal bed in the washing region of the column. Characterized an analog to sweating of the crystals cleaning effect is achieved. Thus a purified first by washing the surface of the (meth) acrylic acid crystals having melted - and thus already gereinigter- (meth) acrylic acid causes the other is (on existing by the crystallization of the melted purified (meth) acrylic acid Meth ) acrylic acid crystals obtained annealing or exudation of impurities. This allows the high-purity preparation of the (meth) acrylic acid. In a specific embodiment of the method according to the invention, the recycle stream, the recycle from the supply of melted (meth) acrylic acid from step c) to step a) or in step b) results in greater than a feed stream of the composition, which is supplied continuously from outside the step a). In particular, the recycle stream is at least twice, preferably at least ten times as large as the feed stream. Due to the large recycle stream that the thermal load of the (meth) acrylic acid is reduced at the melter is ensured. For vaccination to be crystallized (meth) acrylic acid, it is advantageously at least partially separated out, crystallized (meth) acrylic acid from step b) to step a). The recirculated (meth) acrylic acid crystals facilitate crystal growth in step a) and so aid in the separation of (meth) acrylic acid from the mother liquor. This is particularly advantageous for an aqueous composition. Basically, because of energy considerations a one-step purification procedure with only one Verfahrensstu e is particularly advantageous and is therefore particularly preferred. Under certain circumstances, however, a two-step purification process makes sense. To increase the yield, it is desirable, at least in part, the separated according to step b) the mother liquor in the step a). In the mother liquor remaining (meth) acrylic acid is preferably up to the thermodynamic limit (for example, eutectic) may be as with suitable spatial temperature profiles can be further crystallized. (Α4) mother liquor, especially after step b) separated mother liquor, a second process stage is at least partly fed to a first process stage. (SS6) is separated after the step b) the mother liquor of the second process stage is at least partly supplied to the step a) the first process stage. (4) in order to provide seed crystals of high purity is available crystalline (meth) acrylic acid from the second stage of the process step a) the first process stage is supplied. (4) to minimize the energy expenditure is supplied crystalline (meth) acrylic acid from the second .Verfahrensschritt step a) the first process stage. Here, most preferably is a combination of the embodiments (2) and (4). Advantageously, at least two Verfahrensstu- fen provided in series. In series may be both on the separated (meth) acrylic acid, that is, refer to the crystalline or in the molten (meth) acrylic acid, as well as the separated mother liquor. it is advantageous to nest and at least two process stages together. This has the effect that the number of necessary for melting melter, the e- as a heat exchanger or heating 'nergieauf Endig are in operation is less than the number of stages. For example, can mean a savings of a melter a simple nesting of two process stages. This operation at the same yield and the same purity is significantly more cost effective. The number of process steps depends on the to be achieved with the process of purity and profitability. Basically, the achievable purity of (meth) acrylic acid by *, the ther odynamische limit (for example, eutectic) for a limited crystallizability of (meth) acrylic acid from the mother liquor. (Γ2) separating the (meth) acrylic acid crystals from the mother liquor by means of a washing column, is recycled the mother liquor from step (γ2) is at least partially in the step (γl), wherein the crude (meth) acrylic acid stream has a purity of <99, 5 wt -.% comprising of (meth) acrylic acid. wherein the purification device comprises an inlet, a composition comprising (meth) acrylic acid, at least one impurity and water, wherein the composition has a water content in the range of 0.55 to 90, preferably from 7 to 50 and particularly preferably 10 to 25 .-%, based on the composition, which leads. The term "fluidly" is understood according to the invention that gases or liquids, suspensions included, or mixtures thereof are passed through respective lines. For this purpose, can be particularly pipelines, pumps, and use the same. Due to the low degree distillation, the thus prepared (meth) acrylic acid is particularly treated gently, thus their quality is improved. Moreover, the so obtained pure aqueous (meth) acrylic acid in solution, emulsion or suspension can be used, whereby an adverse change of solvent of the same or different solvents is avoided compared to the conventional reaction. In one embodiment of the invention Vorrich- processing, it is preferable that the (meth) acrylic acid synthesis unit and the purification apparatus are connected to one another without a distillation apparatus. In another embodiment of the device according to the invention, it is preferred that the quench and the purification apparatus are connected to one another without a distillation apparatus. An inventively preferred apparatus for producing acrylic acid comprises in the range, which has a (meth) acrylic acid reactor and a quench, preferably the following structure in the synthesis of acrylic acid to: propylene and other inert gases, if necessary, such as nitrogen or combustion gases such as C0 2 or nitrogen oxides are fed into a first reactor to a first catalytic oxidation via a reactant supply, which opens into the first reactor. The first reactor is connected via a further line to a second reactor, in which the product of the first catalytic oxidation from the first reactor to a second catalytic oxidation is initiated. The acrylic acid-containing product of the second catalytic oxidation is supplied through a line located between the second reactor and the quench pipe of the lower half of the quench absorber. In the quench the product of the second catalytic oxidation is brought into contact with water, the water is fed above the feed of the product of the second catalytic oxidation in the quench. Firstly, an acrylic acid and water is drained-containing first phase below the feed of the product of the second catalytic oxidation from the Quen- chabsorber. This first phase may be at least partially recycled back above the feed of the product of the second catalytic oxidation back into the Quen- chabsorber. The not recycled into the Quen- chabsorber first phase of the distillation apparatus is supplied to be subjected to, for example, an azeotropic separation in which the acrylic acid is concentrated and purified. Above the return of the first stage and below the inlet feed of water into the quench an acrylic acid and water can be discharged-containing second phase from the quench. This second phase can be the same as the first phase of the distillation apparatus is supplied to be subjected to, for example, an azeotropic separation in which the acrylic acid is on onzentriert and purified. The abgeleiten from the quench exhaust gases can be supplied to a cata- lytic combustion. The combustion gases of the catalytic combustion can be fed into the first reactor as I- nertgase. The recovered during the concentration of acrylic acid water can be recycled to the quench. Further details of the preparation of acrylic acid are disclosed in DE 197 40 252 Al, the contents hereby incorporated by reference as part of this disclosure. The synthesis of acrylic acid according to the invention may also be in a synthesis unit which converts propane directly to acrylic acid. In addition, the synthesis of acrylic acid in an aqueous reaction media, preferably, carried out as a homogenous catalysis. At a reaction in aqueous reaction media, the acrylic acid would be obtained in the form of the water-rich composition without a Wasserzugbe would be necessary in a quench. A preferred device according to the invention for the production of methacrylic acid comprises methacrylic the reactor and a quench in the synthesis of methacrylic acid by catalytic gas phase reaction of C4 starting compounds with genetic oxygen. Particularly preferred is methacrylic acid by catalytic gas phase senoxidation of isobutene, isobutane,.-Butanol "tert, isobutyraldehyde, methacrolein or meth-butyl ether available. Further details of the preparation of (meth) acrylic acid are disclosed in EP 0092097 Bl , EP 0058927 and EP 0 0608 838 discloses the contents of which are hereby incorporated as part of this disclosure. to gain weight .-%. It is possible according to the invention, contaminated raw (meth) acrylic acid stream containing 50 wt .-% to 95 wt .-% of (meth) acrylic acid, preferably 75 wt .- purify% to 90 wt .-% of (meth) acrylic acid efficiently. This effective purification allowed the preliminary purification of crude (meth) acrylic acid stream by means of the distillation apparatus to reduce, whereby the thermal loading of the (meth) acrylic acid is reduced. With this, the quality of the (meth) acrylic acid is improved. To further increase the purity of the (meth) acrylic acid, the apparatus unit has a separate purifying apparatus. This separate cleaning device can be used for further purification of the final product, in particular for further purification of leaving the melter (meth) acrylic acid. For improved crystallization of the separation region with the crystallization region is preferably connected through a first recycle line for separated (meth) acrylic acid. To increase the yield is advantageously the separating region is connected to the crystallization region by a second recycle line for separated mother liquor. Basically, due to energy considerations, a single-stage purification device with only one device unit is particularly advantageous and is therefore particularly preferred. Under certain circumstances, however, a two-stage purification device makes sense. (Ε4) the melter to a second apparatus unit is connected via the connecting line to the crystallization region of a first apparatus unit. Here, the connection lines accessories such as return both also can be. For example, it is advantageous according to the inventive method for increasing the yield of the separation zone of the first device unit (first process), a supply line to the crystallization region of the second device unit (second stage) to be provided. A feedback between the separation portion of the second step and the crystallization region of the first stage, however, is useful for the provision of seed crystals. It is thereby possible in an advantageous manner to provide a series connection of at least two apparatus units to improve the purity and yield. By incorporation of the at least two device units the number of required melter can be reduced and thus the energy consumption be reduced to the operation of the device. In the inventive method for the purification of acrylic acid in the separation zone, a temperature in the range of -20 to 20 ° C, preferably from - 10 to 13 ° C at a pressure of 1 to 10 bar. It is preferable that in the lower portion of the separation area prevail a lower temperature and a lower pressure than in the upper region of the separation area. Preferably prevail in the lower region of the separating region -20 to <12 ° C at a pressure of 1 to 2 bar. In the upper area of ​​the isolating area there is a temperature of at least 12 ° C and a pressure of 1 to 10 bar, preferably 3 to 7 bar. In DEM novel process for the purification of acrylic acid in the melter, a temperature in the range of 10 to 50 ° C, preferably 11 ° to 30 ° C at a pressure of 1 to 10 bar, preferably 3 to 7 bar. In the inventive method for the purification of methacrylic acid in the separation zone, a temperature in the range of -5 to 30 ° C, preferably from -3 to 20 ° C at a pressure of 1 to 10 bar. It is preferable that in the lower portion of the separation area prevail a lower temperature and a lower pressure than in the upper region of the separation area. Preferably prevail in the lower region of the separating region -16 to <15 ° C at a pressure of 1 to 2 bar. In the upper region of the separation zone a temperature of at least 15 ° C and a pressure of 1 to 10 bar prevails. In the inventive device for the purification of methacrylic acid in the crystallization region, a temperature in the range of -5 to 30 ° C, preferably from -3 to 20 ° C at a pressure of 1 to 10 bar, preferably 1 to 2 bar. In the inventive device for the purification of methacrylic acid in the melter, a temperature in the range of 10th to 50 ° C, preferably 11 ° to 30 ° C at a pressure of 1 to 10 bar, preferably 3 to 7 bar. In the guides prevail temperature and pressure conditions that allow safe and trouble-free transportation of the (meth) acrylic acid and the latter is optionally accompanying substances in these guides. The inventive apparatus allows to start from a relatively contaminated (meth) acrylic acid, whereby the preliminary expenditure of a distillation originating from the synthesis of (meth) acrylic acid is low. Thus, in particular, the thermal load of the (meth) acrylic acid, which can lead to unwanted polymerizations decreases. Furthermore, the invention relates to an apparatus for the polymerization of (meth) acrylic acid, comprising an apparatus for preparing (meth) acrylic acid and a polymerization unit, wherein the Aufreinigunsvor- direction of the apparatus for preparing (meth) acrylic acid with the polymerization unit of connectedness the are. Further, the invention relates to a (meth) acrylic acid obtainable by the process of this invention for purification. In addition, the invention relates to a process for producing a (meth) acrylic acid-containing polymer wherein an inventive (meth) acrylic acid, a purified phase according to the invention, obtainable by the ER inventive method for purification, is polymerized Siert. The polymerization is preferably carried out as a solution polymerization, wherein the reaction is particularly preferably in a troughing. Here, either the aqueous phase is used directly or diluted, the water-poor phase accordingly. In general, the polymerization is carried out in a medium having a water content of 20 to 80 vol .-%, based on the medium. Moreover, the invention relates to a polymer obtainable by the process described in the preceding paragraph. The fibers of the invention, molded articles, films, foams, superabsorbent polymers or hygiene articles based at least on or at least include according to the invention, the (meth) acrylic acid or polymer of the invention. The inventive (meth) acrylic acid or the inventions dung modern polymer is used in or for the manufacture of fibers, moldings, films, foams, superabsorbent polymers or hygiene articles. The inventive apparatus or purification device according to the invention or the method according to the invention contains more than 95 wt .-% and particularly preferably more than 99.5 'are used for the production of acrylic acid which, preferably a purity of more than 90 wt .-% which .-%, each based on the (meth) acrylic acid with impurities. (Meth) acrylic acid stream preferably has a purity of <99.5 wt .-% of (meth) acrylic acid, a mechanically operated wash column (Diss. Posch man, p.18) according to the invention is particularly preferred. In a mechanical wash column - by way of example, reference is made to EP 0193226 B and NL 1007687 A - a dense crystal bed within the column is generated by means of a permeable for the melt piston. The piston may be located at the upper or lower end of the column; in the first case, the feed of the suspension in the upper region of the column, in the second case in the middle or lower portion. The piston is permeable to the melt so that occurs during compression and melt at the back of the piston off is subtracted there. Analogously as a hydraulic 'wash column and the mechanical scrubbing column comprises means for scraping, for example a moving, preferably rotating scraper member to scrape off the crystals from the crystal bed and to transfer to the wash melt in a suspension. The wash melt moves in countercurrent to the crystal bed. From the opposite side of the piston washing column suspension is withdrawn, and after melting may be recycled and the other part can be withdrawn as Reinstprodukt from the circuit part of the melt melt as washing. Embodiments for suspension crystallization with subsequent washing of the crystals in a hydraulic or mechanical wash column are the book "Melt Crystallization Technology" by GF Arkenbout, Technomic Publishing Co. Inc., Lancaster-Basel (1995), pp 265-288, as well as the to the Niro freeze concentration directing to Abwasservorkonzentrierung products in Chemie Ingenieur Technik (72) (1QJ2000), 1231-1233. As the washing liquid, a washing liquid known to the expert can be used (in aqueous solutions such as water) depending on the application. Very particularly preferably used for washing the crystalline (meth) acrylic acid as already indicated a subset of the molten crystals thereof. By this measure, one is to ensure that the production of high purity products, no other material has to be introduced into the system, on the other hand the molten crystals also serve to push back the mother liquor front in the wash column and practice simultaneously on the crystals a cleansing effect analogous to the sweating out . A product loss does not take place, as the washing liquid in turn crystallizes on the crystals to be washed and thus the product finds (eg brochure from Niro Process Technology BV, Crystallization and wash column separation set new standards in purity of chemical compounds). It is further preferred in the inventive method, that the method is carried out in an inventive device. With n-butanol, the (meth) acrylic acid can be recovered by extraction. Remains an aqueous phase in which the secondary components are dissolved. The ex traction of (meth) acrylic acid from impure solutions is known in the art such as distillation. Butanol (Vogel et al. Chem. Eng echnol .23. Extraction in 1990, Ed. T. Sekine, Elsevier Science Publishers BV, pp. 1791 - 1796; JP 57095938; WO 98/40342; Information leaflet of the company Sulzer Chemtech fractional extraction of (meth) acrylic acid with n-butanol). Advantageously, the mother liquor from step b) prior to returning to step a) at least one time by a process comprising the steps a) and b treat) and the respective purer branched partial stream in step a) the origin or of a predecessor procedure traced, thereby generating with minimali- siertem yield loss maximum purity. FIG. 2 illustrates this fact. The mother liquor of the crystal separation in the wash column can also be treated in a subsequent crystallization region. The resulting suspension can then in turn be worked up in a wash column as usual. The now resulting mother liquor can be treated similarly in the following stages. It has thereby caused the selection, the resulting purer each partial flows in the crystallization of the first cleaning method in this procedure or in the crystallization of a previous process. Thus, a maximum of purity with a minimum of waste can be realized with relatively low expenditure on apparatus. The methods of the invention can be operated continuously or batchwise, with continuous operation is preferred since such an operation is particularly economical. The invention further relates to an apparatus for the polymerization of (meth) acrylic acid, comprising an apparatus according to the invention for producing (meth) acrylic acid and a polymerization unit, wherein the Aufreinigunsvorrichtung of the apparatus for preparing (meth) acrylic acid is connected to the polymerization unit. In this Polymerisationsein- standardized, it may be a stirred tank reactor or a kneading or troughed belt in or on which the polymerization takes place. In the water-rich phase, the troughing polymerization is advantageous. The water-rich phase has a water and (meth) acrylic acid concentration, which are particularly suitable for the solution polymerization of based on (meth) acrylic acid polymers, preferably superabsorbing polymers, and specialty polymers for leather and paper production as well as waste water treatment, is suitable. Further, the invention relates to a process for the preparation of a system based on (meth) acrylic acid polymer, an inventive. (Meth) acrylic acid or a purified phase, obtainable by the process according of invention, for the purification of (meth) acrylic acid is polymerized. The polymers obtainable by this process are preferably Su- perabsorber, specialty polymers for the fields of wastewater treatment, dispersion paints, cosmetics, textiles, leather processing or paper production. In addition, the invention relates to fibers, moldings, films, foams, superabsorbent, specialty polymers for the fields of wastewater treatment, dispersion staining, cosmetics, textiles, leather processing or paper manufacture or hygiene articles, at least based on or including the present invention purified (meth) acrylic acid or polymer of the invention. Finally, the invention relates to the use of the inventively produced (meth) acrylic acid or a polymer of the invention in or for the manufacture of fibers, moldings, films, foams, superabsorbent polymers or sanitary products, detergents or special polymers for the areas of waste water treatment, dispersion staining, cosmetics, textiles , leather finishing or papermaking. Under superabsorbent polymers mean polymers which absorb several times their own weight of water or aqueous liquids. Preferably, superabsorbent polymers are based on more than half of acrylic acid as a monomer. Further details of superabsorbent polymers, their preparation and use in hygiene articles are "Modern Su- perabsorbent Polymer Technology", Fredric L. Buchholz, Andrew T. Graham, Wiley-VCH, to remove 1998 the contents of which reference genome as part of this disclosure men is. These superabsorbent polymers are Favor incorporated in sanitary products. Among the hygienic articles are diapers, adult incontinence products and sanitary napkins are particularly preferred. Furthermore, the combinations of features resulting from the above-identified features with figures each represent particular embodiments of the present invention. Further details and advantageous refinements are explained using the following drawing, which is intended to illustrate the invention by way of example, in more detail. Figure 2 is a process scheme according to the invention with two process stages in a series circuit. Figure 3 is a process scheme according to the invention with two process stages in interleaving. Fig. 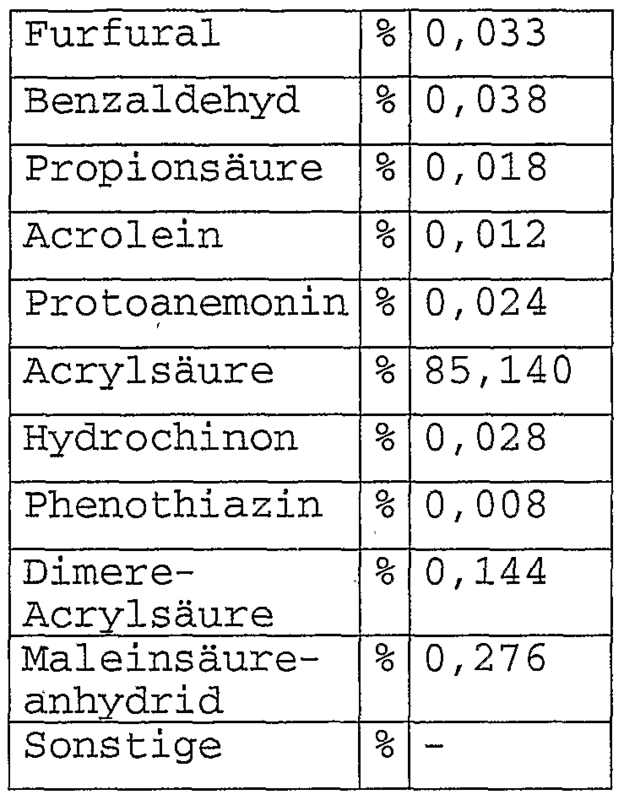 9 shows a crystal habit of acrylic acid from a 70/30 w / w acrylic acid Wassergemisc invention. The washing column 5, the suspension generator 3, the product circulation heat exchanger 8, the inlet 4, the product circuit 6 and the recirculation of product 10 corresponding to the separation region, the crystallization region, the melter, the first guide, the second guide, the fourth and, if in the wash column crystal formation takes place, the third guide. The crystals in the wash column 5 are compressed to form a crystal bed and scraped off depending on the type of wash column the top or bottom with revolving knives. The scraped-off product crystals are pumped as a suspension in the product circuit 6 with the circulation pump 7, and melt on the Aufsehmelzer or product heat exchanger 8 by the introduction of the melting enthalpy. A portion is recycled as washing liquid to counter-current washing in the washing column through the product recirculation 10th The other part exits the system as a product in. The tank 9. If at this stage procedure a minimum of loss of product by the kick can not be achieved, the mother liquor from the first crystallization stage may be optional in one or more further • crystallisation step or worked up with other cleaning agents. The suspension generator 15, the washing column 17, the product circulation heat exchanger 20, the inlet 16, the product circulation 18, recirculation of product 22, the mother liquor recycle 23 respectively correspond to the first apparatus unit to the crystallization region, the separating region and the melter, the first guide, the second guide, the third and fourth guide, the second feedback. The suspension generator 26 ■ washing column 28, the product circulation heat exchanger .and 31 of the product circuit 32, the recirculation of product 29, the mother liquor recycle 33 respectively correspond to the second apparatus unit to the crystallization region, the separating region, the melter, the second guide, the third and fourth guide , the second feedback. The mother liquor supply 25 corresponds to a dungs1eitung connects. The mother liquor (12/13) from the 1st stage is fed partly or completely into the suspension generator of the 2nd stage 15th By cooling below the equilibrium temperature of the melt occur in the suspension generator 15 continuously crystals having a suspension density of between 5 and 50% (preferably 20 to 30%). The suspension is continuously fed via the inlet 16 into the washing column of the 2nd stage (17) and (hydraulically or mechanically, see above) separated there by moving or fixed filter into a liquid and a solid phase. the crystals are compacted into a crystal bed scraped off depending on the type of wash column 17 up or down with the current environmental diameters. The scraped-off product crystals are optionally pumped as a suspension in the product circuit 18 with the circulation pump 19 (as in the 1st stage) and melt in the melter 20 through the introduction of the heat of fusion. A part can be recycled as washing liquid to counter-current washing in the washing column 22. The other part can be recycled as the molten product in the suspension generator of the first stage. 3 The filtrate leaves the wash column 17 and is continuously supplied to the mother liquor tank 24th To further increase yields, it is optionally possible to at least recycle a part of the filtrate via the mother liquor recycle 23 into the suspension generator 15 switched on and / or further establish in a 3rd stage. Figure 3 shows another preferred interconnection of the work-up method. The suspension generator 42, the washing column 44, the product circulation heat exchanger 47, the product circulation 45, recirculation of product 49, the inlet 43 respectively correspond to the first apparatus unit to the crystallisation section, the separating section and the melter, the second guide, the third and fourth guide, the first guide. The suspension generator 51, the washing column 53, the feed 52, the mother liquor recycle 57 respectively correspond to the second apparatus unit to the crystallization region, the separating region, the first Guide of the second feedback. The feeds 54, 50 correspond to connecting lines. The nesting hereby exemplified advantageously allows that the second processing unit Vorrich- no melter needed. A particularly preferred variant of a two- or multi-stage design leads to be separated melt of the first stage 41 through the lead 56 and the pump 55 into the head of the wash column of the 2nd stage 53 in order there, the scraped product crystals of the second stage as a suspension 54 in the to lead suspension generator of the 1st stage 42nd This variant has not to freeze once again the energetic advantage of being able ziehten comparable to a melting in the second stage and are now present in the first stage crystals. The counter-current washing in the washing column of the 2nd stage 53 is achieved here by the melt from 41 via inlet 56 of the 1st stage, the supply concentration compared to the contamination is very pure in the 2nd stage and hence a similarly effective washing as a allows washing product. Although a combination is known from a scraped condenser, and a washing column for producing organic substances having high purity was not foreseeable that this method also for concentrating 'of (meth) acrylic acid with starting purities of <99.5% by weight and with high water content , based on the amount of acrylic acid is very suitable. was also surprising that the content of impurities such as other organic carbon compounds, advertising significantly reduced by the inventive process to values ​​of the can. Such critical variables such as furfural, inhibitors, acetic acid or maleic acid can be depleted to uncritical values ​​straight. This is the art was not apparent and is also not suggested by this. FIG. 4 shows an inventive process scheme with a process step, and FIG. 5 shows an inventive process scheme with two process stages. Fig. 4 shows a device according to the invention for producing (meth) acrylic acid is a (meth) acrylic acid reactor 74, a quench absorber 75, a distillation device 76 and a purification apparatus 77, wherein the purification device 77 includes a crystallization region 61 and a separating region 62 , The crystallization region 51 and the separating portion 62 are close together, preferably the crystallization region 61 and the separating portion 62 not via pipes but directly to each other are connected. Preferably takes place in a single housing during the washing of the crystals, and in particular the separation of the crystals from the mother liquor, and crystal growth take place. The crystallization region 61 and the separating portion 62 are connected by a first guide 66 which can be formed by the common housing, each other. The rich Trennbe- 62 is connected via a second guide 74 to the fuser 63, which melts the separated from the mother liquor in the separation region (meth) acrylic acid crystals. The molten (meth) acrylic acid is conveyed by a pump 79 either through a fourth guide 67 for separating region 62, or via a third guide 65 to the crystallization region 61st Advantageously, providing a separate cleaning device 68 for increasing the purity of the (meth) acrylic acid. To the crystallization in the crystallization portion 61 will promote separated by means of a first feedback 69 in the separating region 62 (meth) acrylic acid crystals supplied as seed crystals in the crystallization region 61st The yield is increased in the remain- .for to incomplete separation in the separation area 62 in the mother liquor - bene (meth) acrylic acid is recovered by passing the mother liquor from the separation zone 62 is supplied via a second feedback 70 to the crystallisation region 61st By means of a product effluent 81 the purified (meth) acrylic acid is removed from the circuit. By means of a residual mother liquor sequence 80 is no longer taken usable residual mother liquor. Crystallization region 61 of the first integrated Vorrichtungsein- 60 supplied. By this post-cleaning an improved purity of the obtained (meth) acrylic acid overall is ensured. Fig. 6 shows a crystal habit pure acrylic acid at an equilibrium temperature of 12.7 ° C and a crystallization temperature of 11.25 ° C with a crystallization time of 2 h.
Fig. 7 shows a crystal habit of acrylic acid according to the invention from a 90/10 w / w acrylic acid-water mixture with an equilibrium temperature of 4.5 ° C with a starting temperature of 3.1 ° C and a cooling rate of lK / h with a crystallization time to 1 5 h. As the comparison with Fig. 6 and Fig. 7 shows indeed have crystals of the invention also a small number of inclusions, the habit but rather modified so that occur at the respective upper surface of the crystals recesses from which flow mother liquor advantageous can. It is apparent that not all crystals are affected by this phenomenon. Fig. 8 shows a crystal habit of acrylic acid according to the invention from a 80/20 w / w acrylic acid-water mixture at an equilibrium temperature of - 2 ° C and a starting temperature of -3.5 ° C at a cooling rate of lK / h and a crystallization time of 1 , 5h. One can see that all the crystals are affected and increases the size of the indentations. Fig. 9 shows a crystal habit of acrylic acid according to the invention from a 70/30 w / w acrylic acid-water mixture at an equilibrium temperature of - 7.5 ° C ° C, and a starting temperature of -8.7 ° C at a cooling rate of lK / h and a crystallization time of 1.5 hours. Fig. 5. It is apparent that general Kristallde- increase fect, the actual habit is still clearly visible '. The recesses are sometimes so great that the crystals are hollow inside. Even in such a case, the drainage of mother liquor is ensured and the washing of further impurities is made possible. The invention will now be described with reference to non-limiting examples. In a device according to FIG 1 with a scraped surface crystallizer to the suspension and forming a mechanical wash column with arranged below the piston and above the extractor arranged purified melt acrylic acid with the following composition (Table 1) was placed in the scraper cooler. 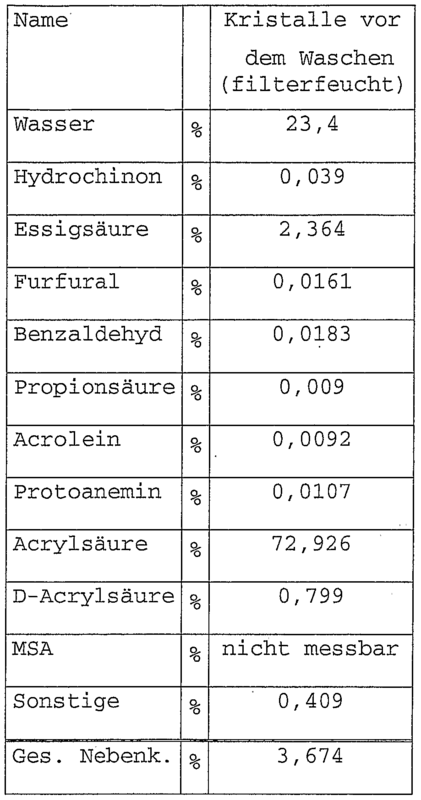 As a feed (low water-containing composition) acrylic acid was used the same composition shown in Table 1. The scraper cooler has been cooled, it was in the scraper cooler at about -5 ° C to form a crystal layer was scraped off by the rotating scraper in the scraper cooler to form a suspension. The filtered mother liquor was always completely sluiced out of the process. After about 12 hours of operation, the liquid phase (= the filtrate from the wash column) had in the crystallizer to the composition according to Table 2 below. The withdrawn from the crystallizer crystal suspension was concentrated in the wash column into a compact crystal bed. this was scraped off by means of a rotating scraper, pumped as a suspension of crystals in the product cycle and melted by the heat exchanger on the upper side of the crystal bed. One part was returned to the counter-current washing in the crystal bed, to keep the wash front constant so that neither product nor mother liquor strikes through the crystal bed. The other part was continuously recovered as product. Exemplary of the achieved product qualities, the mean values ​​of the product analysis of those acrylic acid are mentioned in Table 3, which was about 1-3 hours later than the sample of Table 2 taken overall, that is about 12 to 15 hours after start of the test. As can be seen from Table 3, the inventive method allows the production of high purity acrylic acid. In a stirred jacketed vessel of a Quenchabsorbersumpfes a Acrylsäureanla- were 760g of a sample ge with a composition according to Table 4 and cooled by a cryostat. The sample presented was further cooled to 11 ° C and thereafter at a cooling rate of 0, lK / min. At -15 ° C was inoculated with reasonable 1mg 1mg ice and glacial acrylic acid. Then there was a turbidity of the solution. After another 10 minutes, the suspension was isolated on a tempered to 0 ° C with vacuum Saugnutsehe 250μm- Propyltex filter cloth solid-liquid. 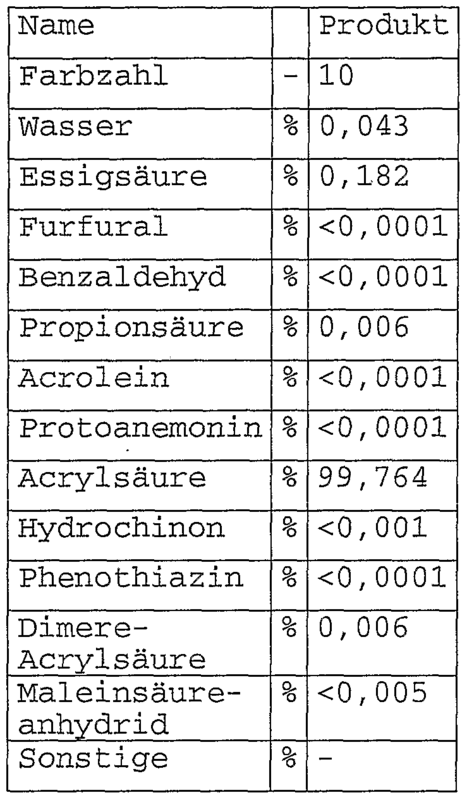 The thereby resulting mother liquor (filtrate, 380g) has a com- position according to Table 5 below. This mother liquor is more depleted in acrylic acid than water. The filter wet crystals according to Table 6 were washed with an amount of 200g to 0 ° C temperature-controlled deionised water. The filter cake thus obtained has the composition shown in Table 7 below. The above amounts were determined by gas chromatography. 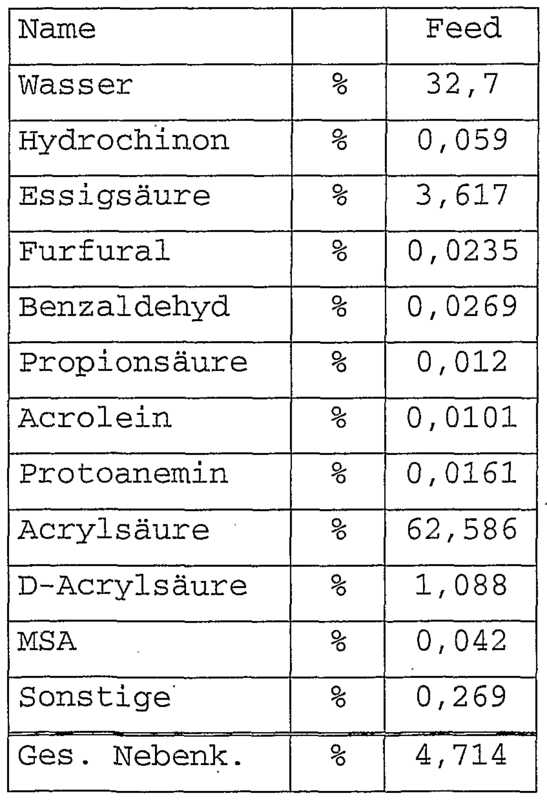 In this example (Nebenk Ges..), A significant depletion of the aqueous acrylic acid accompanying by-products from the synthesis of acrylic acid was achieved, as is apparent from the comparison of the total secondary components is obtained. (Meth) acrylic acid is present. 2. The method of claim 1, wherein in the step (a) meth) acrylic acid at least partially crystallized to form a crystal having a crystal structure having a surface with at least one located at the surface recess, wherein the crystal structure of a orthorombiscb.es Bravais crystal lattice having space group Ibam, crystallographic data a = 9.952 A, b = ll, 767 A and c = 6.206 A. (Meth) acrylic acid crystals are washed in countercurrent in a countercurrent by the recycled melt. Method according to one of the preceding claims, wherein the melt is purified in a separate purification process. 7. The method according to any one of the preceding claims, wherein the separated off after step b) the mother liquor is at least partly recycled into step a). (Α4) mother liquor of a second process stage is at least partly fed to a first process stage. 10. The apparatus of claim 9, wherein the (meth) acrylic acid synthesis unit and the purification apparatus are connected to each other without a distillative onsVorrichtung. 11. Device according to one of claims 9 or 10, wherein the apparatus unit has a separate purifying apparatus. 12. Device according to one of claims 9 to 11, wherein the separation region is connected to the crystallization region by a first recycle line for separated (meth) acrylic acid. 13. Device according to one of claims 9 to 12, wherein the separation region is connected to the crystallization region by a second recycle line for separated mother liquor. (Ε4) the melter to a second apparatus unit is connected via the connecting line to the crystallization region of a first apparatus unit. 15. An apparatus for the polymerization of (meth) acrylic acid, comprising an apparatus for preparing (meth) acrylic acid according to any one of claims 9 to 14 and a polymerization unit, wherein the Aufreini- gunsVorrichtung of the apparatus for preparing (meth) acrylic acid with the polymerization is tion unit connected. 21. The use of (meth) acrylic acid according to claim 17 or a polymer according to claim 19 in or for the manufacture of fibers, moldings, films, foams, superabsorbent polymers or sanitary products, detergents or special polymers for the areas of waste water treatment, emulsion paints, cosmetics, textiles , leather finishing or-papermaking. NL8202517A (en) * 1982-06-22 1984-01-16 Tno A device for the compaction of a suspension. NL1007687C2 (en) * 1997-12-03 1999-06-09 Niro Process Technology Bv An apparatus for separating and purifying solids.